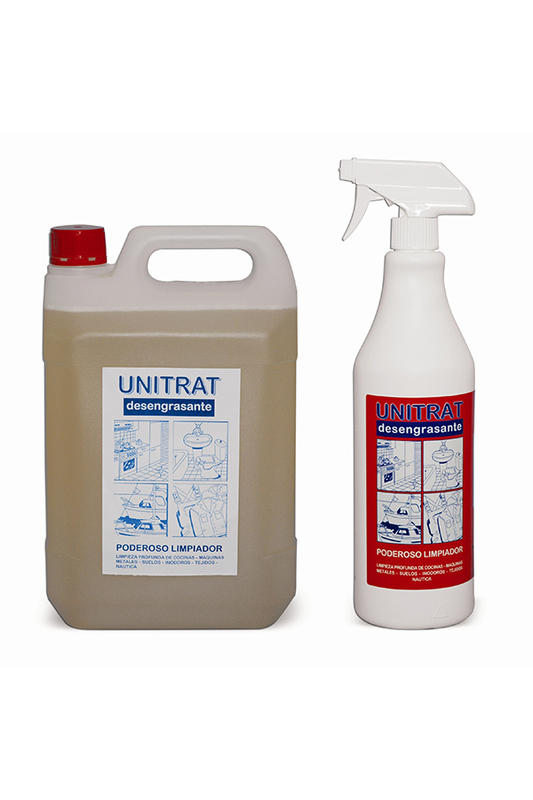 UNITRAT GREASE REMOVER , vectem s.a.
· Highly effective and penetrating detergent and stain remover. · Emulsifies grease even at cold temperatures, eliminating it altogether. · Can be used neat or diluted, sprayed on, or by direct impregnation of the material. Rub on with a cloth or brush and then rinse after a few minutes. Easy-to-use cleaner, perfect for use in workplaces where stubborn dirt is commonplace. Cleans and degreases kitchens, kitchen furniture, plastic and outdoor furniture, machinery, floors and walls. Also for use in industries where dirt abounds. Scrubs off stubborn dirt stuck to paint and cleans stains. Packaging: 1 litre bottle with diffuser, and 5 and 25 litre jugs.